Electrical Safety First is advising anyone spending time in their garden this weekend to use Residual Current Device (RCD) (or “circuit breaker”) protection on their electric equipment. -	Electrical Safety First research shows that over a quarter of Brits don’t know what an RCD is . Ahead of the May Bank Holiday weekend, Bedfordshire Fire and Rescue Service (BFRS) are supporting Electrical Safety First’s campaign to remind gardeners of the importance of using a Residual Current Device (RCD) or “circuit breaker” outside. Research undertaken by the charity shows that one in ten people in the UK have experienced an electric shock or accident while using an electrical appliance in the garden. 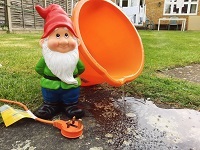 Most accidents in British gardens are caused by electric lawnmowers; with flower pots, electric trimmers, pruners and even the innocent garden gnome making up the top causes of accidents in the garden . Despite more than half of people reporting that they use electrical devices in their gardens , Electrical Safety First found that over a quarter of Brits had never heard of an RCD . Of those who had heard of an RCD, one in six said that they didn’t always use an RCD when using electrical equipment outside . Keeping up appearances is very important for people in the UK; according to the research a neat and tidy garden is most important to British people, which rated higher than a garden being a place to enjoy, or a safe place . Three times more Brits viewed neatness and tidiness as most important in the garden, with just one in eight saying safety in the garden was their top priority. Three quarters of Brits maintain their outdoor space by mowing the lawn, trimming hedges and general gardening . Emma Drackford, Director of Communications at Electrical Safety First adds: “An incredibly high number of people are using electrical equipment in the garden and having accidents outdoors. It’s more important than ever that anyone using mains voltage appliances outdoors uses an RCD. “Lots of people will be taking advantage of garden centre sales ahead of the Bank Holiday weekend to spruce up their gardens. A plug-in RCD can cost as little as £10. A fixed RCD will cost more, but will provide a greater degree of protection to help keep your family safe. We recommend that anyone using electrical appliances outdoors owns an RCD. Not using one could cost you your life”.